Chris, a very good friend of mine, from Canada had a GREAT weekend. Three solid fish with a full floating long line and a swung fly. We both know it is getting later in the season and fish are quickly returning to the lake and even with all the indicator guys "tearing them up" we stuck to our passion, swinging our creations from the vice. Chris told me friday night that he has set two goals for himself to go after this summer. 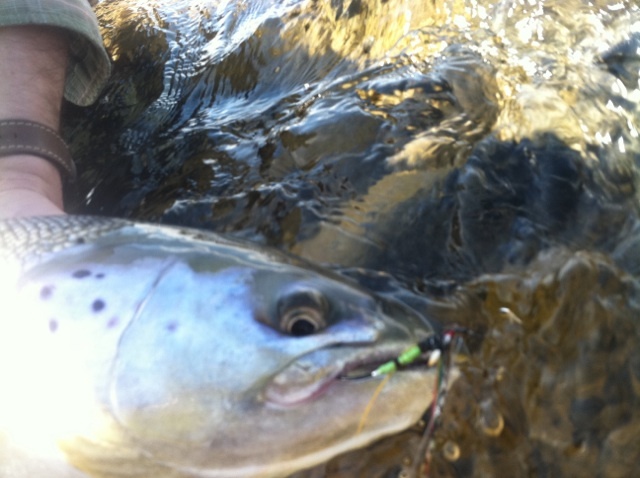 One, catch an atlantic on a married wing pattern and two, catch an atlantic on a dry fly. Saturday, he was able to scratch one off the list when a fully recovered atlantic "killed" his first ever tied, married wing. Good job Chris, that is something to deffinitely be proud of!!! On the other end of the spectrum, ... I am still fishless, and I have nothing to say about that other than focusing on casting and proper technique really aids in forgeting that you are in a slump, which I am. With that being said, I did however encounter the biggest and strongest steelhead yet, in my time chasing steelhead. It was about 3:30pm on saturday and chris had just went in for the day. 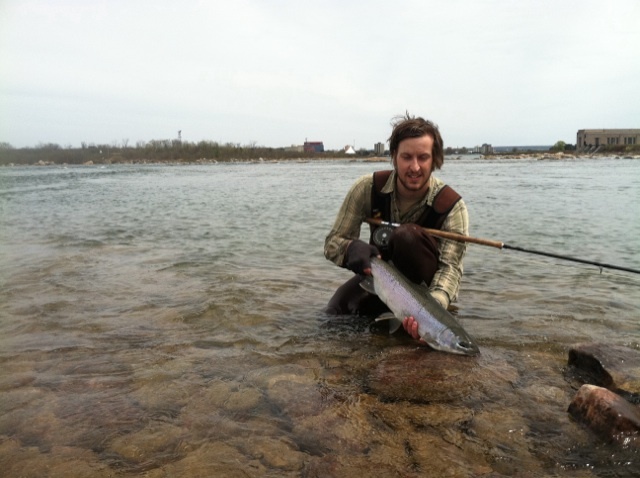 I was just hitting the 80-90 ft range and midway over the dark blue water, it happened, what I believe to be a fresh steelhead absolutely crushed my Kyle Caroline. I cannot put into words how the grab was other than it was the most aggressive one to date and I've had some good takes. Once I set into it, the fish launched completely out of the water. 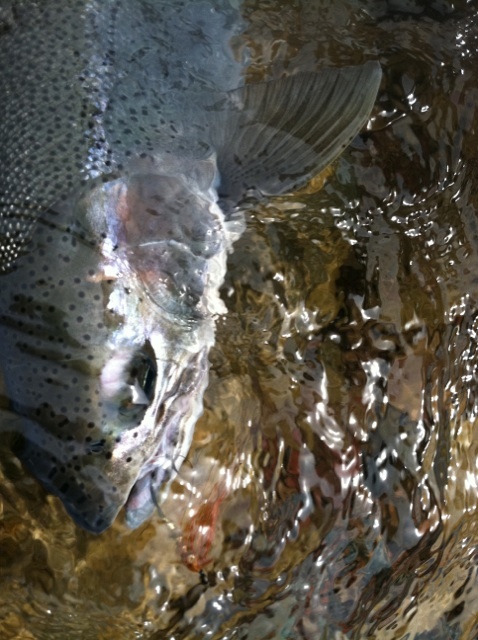 Quickly after the first run and jump, that steelhead showed no respect for my 10 lb tippet and broke me off, leaving me shaking in my skin. Sunday morning I woke up thinking about the fly that I had lost to that chrome bullet. Chris was nice enough to leave me a couple heron feathers that I quickly put to use. I call it the Kyle Caroline, however it is just a variation of the lady caroline without any married bronze mallard. 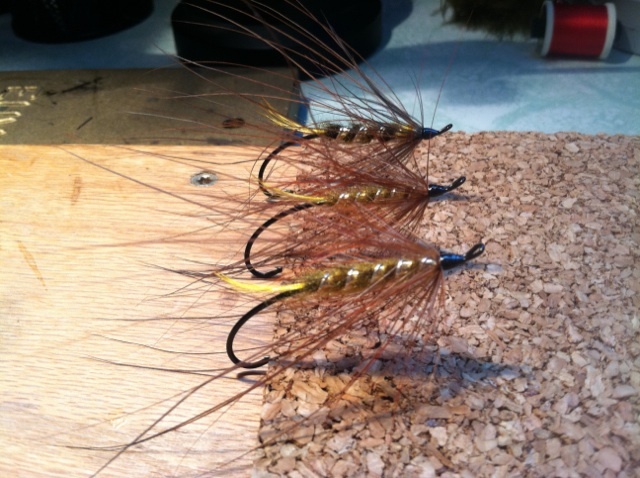 I tied three of them while enjoying the french roast Chris closely watches when I stay and passed one on to him when he arrived on sunday. The fly proved itself when Chris "picked my pocket" on a beautiful steelhead from a run I had just left. As hard as that was to accept, knowing I created that fly, that morning, eased my mind. Again, good work Chris!! Ive attached the blessings from the weekend, I hope you enjoy and continue to follow anglingobsession in this rocky road of swinging flies!!! Good work and beautiful fish guys! Sounds like a great weekend to me.